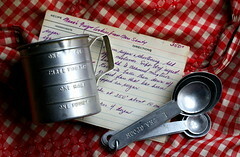 I'm trying to catch up with some blog reading, and I found this giveaway on My Wooden Spoon. Lori is giving away a GelPro floor mat. I'd love to have one of these. I spend a lot of time in the kitchen, and this would be a lot more comfortable than my cheap kitchen rugs. It says so right here. My favorite color and style is the Cordoba in Chestnut. Visit My Wooden Spoon to find out how you can enter to win a GelPro floor mat. 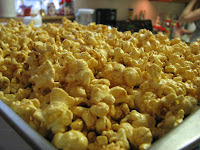 Shortly after I posted the recipe for Microwave Caramel Corn, I found this recipe in the Sunday paper - printed from Jollytime. It's pretty similar, but instead of making it in the microwave, you bake it in the oven. Perfect if you don't have a microwave or if you're running low on paper grocery sacks like me. Coat bottom and sides of large roasting pan with vegetable oil spray. Place popped popcorn in roasting pan. In a heavy pan, slowly melt butter; stir in brown sugar, corn syrup and salt. Heat to a boil, stirring constantly; boil without stirring 5 minutes. Remove from heat; stir in baking soda and vanilla. Gradually pour over popped popcorn, mixing well. Bake in preheated 250° oven 1 hour, stirring every 15 minutes. Remove from oven, and cool completely. Break apart and store in tightly covered container. I didn't measure the popcorn - just popped three batches of air pop (1/2 cup unpopped corn per batch) directly into the roaster pan. Since this recipe is basically double the microwave recipe, and I use two batches for that, I cut the butter, sugar, and corn syrup down - 1-1/2 sticks butter, 1-1/2 cups sugar, 1/4 cup plus 2 T. corn syrup - but if you like your popcorn more coated, just follow the original measurements. I also only used 1/2 tsp. salt and 1/2 tsp. vanilla. The print recipe is the way I made it, and I think it's perfect. This is a great alternative to the microwave recipe. It takes longer to make, but it makes more in one batch. It tastes good, too! This stuff just does not last very long. 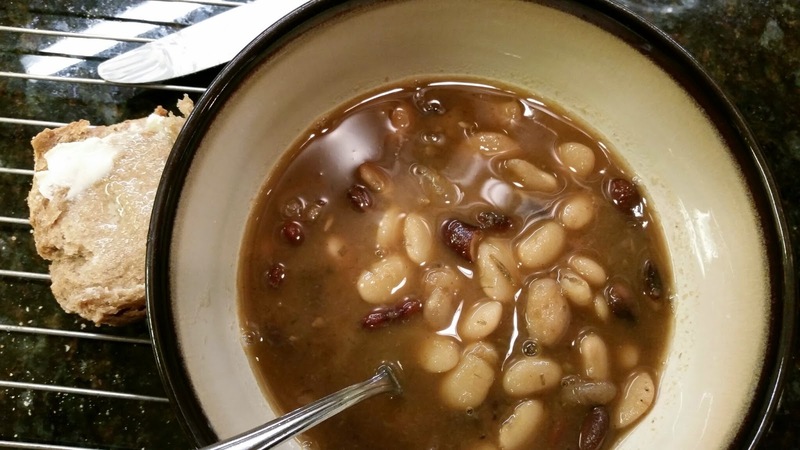 When I was growing up, it seemed we had a lot of meals that consisted of beans and cornbread. While I enjoyed the cornbread, beans were definitely not my favorite thing. Add enough mustard, and they were edible. 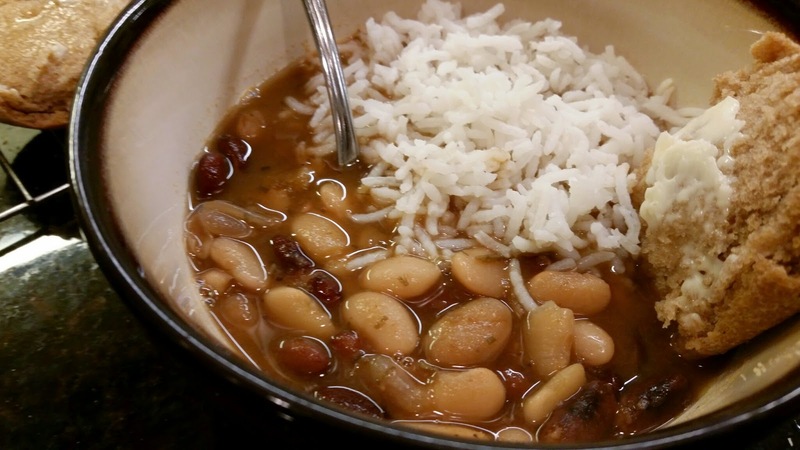 It wasn't until I found this recipe in my first issue of Taste of Home magazine years later, that I decided to give beans another try. Now, this is one of our favorite soups. Measure about 3-3/4 cups of beans. Wash beans; place in a large kettle (6 qt. Dutch oven); add enough water to cover. Bring to a boil; cook for 3-4 minutes. Remove from heat; cover and let stand 1 hour. Drain and rinse beans. Return to kettle; add spices and water. Bring to boil. Reduce heat; cover and simmer 2-3 hours or until beans are tender, stirring occasionally. Add tomatoes and heat through. This soup gets better every time you warm it up. Make the soup one day, refrigerate, and reheat the next day to serve. Add Oatmeal Rolls and a salad and you have a complete meal. Try adding some rice, too. It's really good with the soup. I figured out yesterday why I can't completely go to those reusable shopping bags. I need some paper grocery sacks, if only so I can make caramel corn. Pour sugar mixture over popped corn in bag, shake well, microwave on high for 1-1/2 minutes; take out and shake well; return to microwave for another 1-1/2 minutes. Shake and microwave for another 1-1/2 minutes. I got this recipe from my mom. I'm not sure where she got it from, but it's much easier than the popcorn balls she used to make once in a while, and so good. 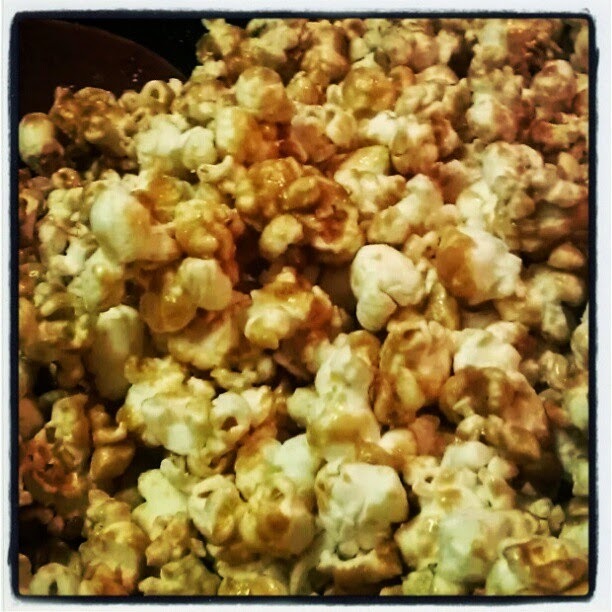 I use air pop popcorn - 2 poppings. This may be a little more popcorn than the original recipe calls for, but the popcorn gets coated nicely, and it's not too sweet.